Once a Project is created choose the Tasks tab from the Projects menu, and enter the task description for each budgeted item. Generally your project tasks will match those items detailed on your original scope or proposal. Tasks are most useful if they also include a budget amount. You can enter an estimated fee value directly, or you build the value with estimated completion hours and a rate. 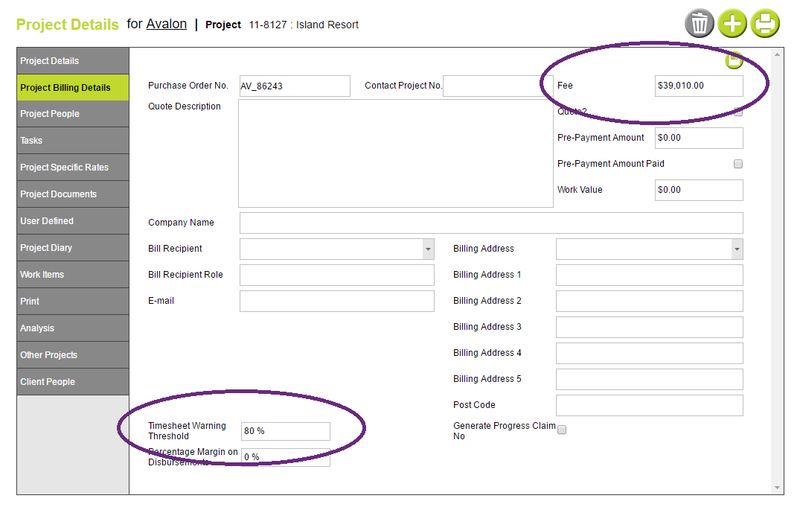 Abtrac will copy the Fee estimate from your tasks back to the Job billing details screen. If many people at different rates will be working on each task then you can right click and create Sub Tasks (Sub Stage or Sub Phase) – these are the time and cost budgets for each person assigned to this task. After creating a Task Description you can go straight to SubTasks and build up the fee, there’s an option to copy back the SubTask total as the Task estimate. Even if you don’t have a budget or estimate for a particular task (be it a variation, or something that you are charging at an hourly rate) it’s a good idea to assign the item of work as a task to your project. You can leave the hours and fee value blank. Later on you can look at the actual time and cost assigned to the task and get a better idea of budgeting for next time. Or you can use the tasks to simply know approximately how much time these variations to jobs typically take (and how they can affect staffing and scheduling of other jobs). What if I use the same tasks all the time? To achieve maximum benefit people usually add specific tasks to each job. These might be the same tasks you use for most projects, perhaps with slight variations. In AbtracOnLine Tasks are managed slightly differently than Abtrac5. There are no default tasks in AbtracOnLine, but you can clone tasks from other projects. This change was made after analysis of the use of tasks in Abtrac5 and from input from the Abtrac community. In offices with Abtrac5 default tasks it was found that job specific tasks would frequently supplement defaults, and that defaults would be revised and overwritten, but the old defaults associated with timesheets needed retained. For system performance and the integrity of reports tasks have been streamlined in the AbtracOnLine database. You can still maintain a list of ‘default tasks’ but they need to be setup within a template project. When you set up Abtrac we recommend you create a non-billable contact for your own company. For this contact enter all the administrative and leave jobs that your staff may use, and any projects that you’d like to track time against. Against the same contact (or perhaps for a new one) we recommend you create a series of template projects. It’s a good idea to number these projects 00 or similar so that they appear first in your drop down list for copying tasks. In the consultancy services example below different project types are required for land, property and infrastructure development. Each template project has been created with the typical associated tasks. Once you have template projects and tasks created, each time you create a new client project you can choose to Copy Tasks. You can choose to copy from any current projects that have tasks associated. There are also options to copy any associated task related activities, and work items. Once the tasks have been cloned you can amend, delete and add items so the descriptions and budgets are specific to your current project. Before you start using tasks it’s a good idea to check the both the tasks and timesheet data entry tables contain all the fields you require. The default Tasks screen includes Task Descriptions, Start and Est Finish Dates, Hours, Rates and Fee Estimates, Disbursements, whether it was Quoted initially, and Comments. You can also build your task budgets using Task Groups, Percentages (of Fee total, or Margins), and SubConsultant details. But these fields are usually hidden in the standard/go live layout of Tasks. 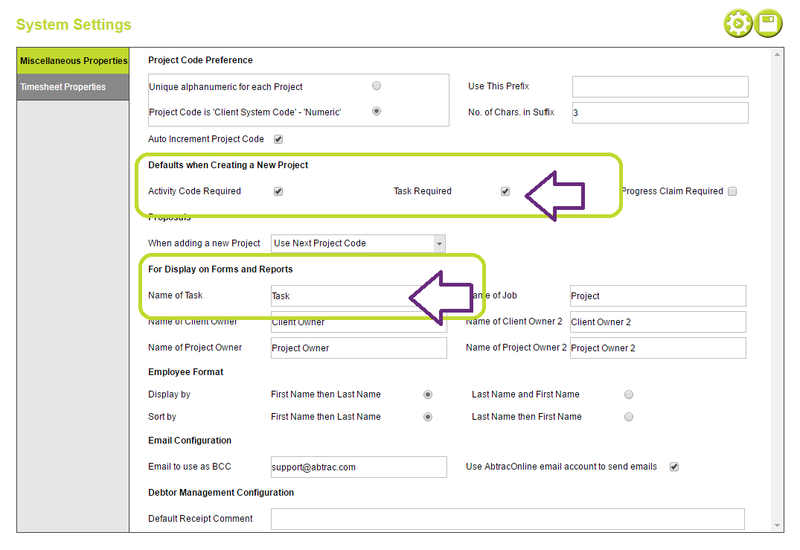 When checking Tasks are displayed for timesheets remember to enable them for Linear and Crosstab Time, and the Disbursement screens also. When entering tasks in the system it’s a good idea to set tasks as required for timesheet entries. You can set projects to include tasks required by default from Administration > Settings > System Settings > Miscellaneous Properties. This only applies to new projects created after tasks have been enabled. If you’re new to tasks but have been using Abtrac for a while you’ll need to check that tasks are required for all your existing projects. You can change the name you use for Abtrac Tasks to Phase, Stage or anything else from Administration > Settings > System Settings > Miscellaneous Properties. If you’ve assigned a fee estimate to your project or task then you can enable Timesheet Threshold Warnings. Timesheet threshold warnings are budget notifications that pop up within the timesheet entries screen when the threshold value specified is reached or exceeded. These warnings can be applied to the entire fee budget for the project, or at the task level. At any stage a user can still enter time against the task and project. Because of which when you enable timesheets warnings it’s a good idea to let the staff know about them, and ask them to contact you if they receive a warning when entering time. The threshold is calculated as a percentage of the Project Billing Details > Fee Value (detailed at the start of this article), and a pop up message is displayed when the threshold value is reached or exceeded. In the example below when the total value of time and cost entered for the project is 80% of $39,010 a warning will be activated. There are two stages of warning when a threshold is set for a job. When the threshold limit is reached timesheet users will receive a message like the warning below. The warning details the percentage threshold and the percentage of time and cost already allocated. And when the time and cost for a project has exceeded its expected fee value the following message is displayed. You can also enter a threshold percentage warning for individual tasks within a project. To do so you’ll need to enable the Threshold column from User Control Settings> Tasks. Once enabled you can enter a percentage of the task fee estimate as the threshold value. A pop up message is displayed within a users timesheet when the threshold value is reached or exceeded. In the example below when the total value of time and cost entered for the task is 60% of the expected fee value of $8,000 a warning will be activated. The warning details the task percentage threshold and the percentage of time and cost already allocated to the task. Project and task threshold warnings also work together so users may also see notifications like the one below: in this instance the task threshold has been exceeded, and the project threshold has been reached. This percentage is not related to any estimates or actual amounts. 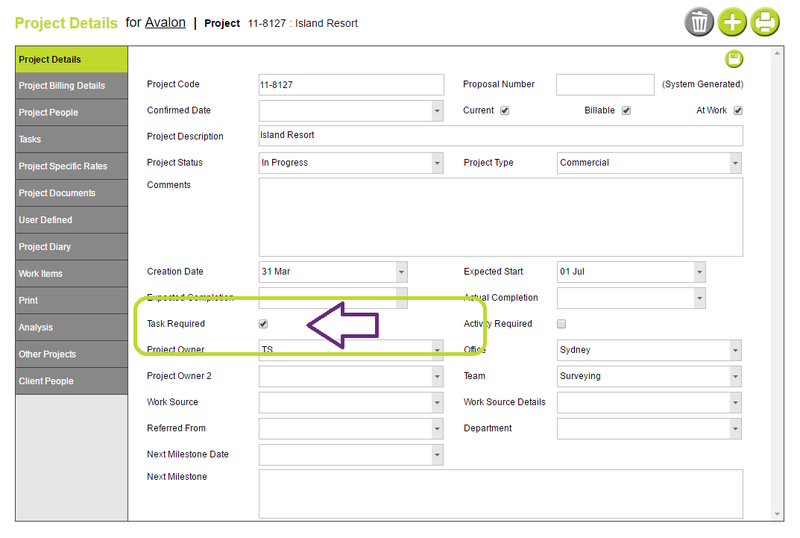 From the Project Tasks screen right click on any task line to enter or view project assessments for each task. It’s not unusual for a client to come back with a variation to the original quote after work is underway. There are a few methods for tracking variations and their budgets. You could simply overrun the original task estimate, but it will show up as large scope creep in your actual vs budget reports. To clearly view and analyse any task variations we recommend one of the two methods below. Add a new independent task (or tasks) for the current project. Your fixed fee for the project could remain the same by keying the original amount into Project Billing details directly, but the fee estimates total for all tasks will increase with the new addition. Add additional values to the current tasks. Another option is to enable the Additional Values estimate columns in the Tasks screen from Administration > Settings > User Control Settings. These allow you to add a second column of budgets to your original tasks. These are detailed in the Actual vs Budget by Project, Task and Additional Values reports. This entry was posted in Getting Started, Jobs & Projects and tagged budgets, employees, phase, task stage by Jen. Bookmark the permalink.